Whether you are self-conscious because you have yellowed teeth from smoking or drinking coffee, or you just want to look your best, tooth whitening is a sure way to brighten your smile and gain increased confidence in your appearance. The tooth whitening process eliminates discoloration and stains on the teeth, and can also brighten the natural pigmentation of the teeth. The degree of improvement is variable and will depend upon how severely the teeth are stained or discolored, as well as the nature of the stains. When teeth are brown or yellow due to coffee, tea, or smoking, stains will generally lighten four to five shades. Teeth that are gray due to natural pigmentation or antibiotics use will lighten two to three shades. Regardless, your teeth will be noticeably brighter after teeth whitening. While there are a number of over-the-counter teeth whitening methods that make various claims, only a dental professional can recommend the most effective teeth whitening treatment for you. 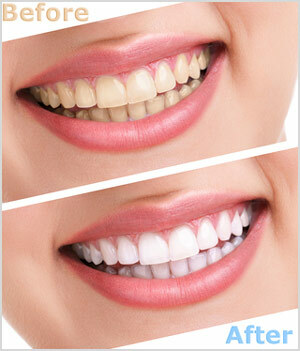 There are several choices for those who are interested in at-home teeth whitening methods. Our office can take imprints of your teeth and then make custom-fitted trays for you to take home to complete the tooth whitening process. There are also over-the-counter products available to brighten your smile. These include a variety of whitening toothpastes and "paint-on" whitening products and whitening strips.